That seemed a lot more clever in my head. 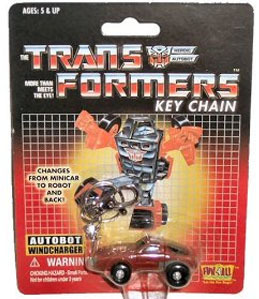 Around 2002 G1 Minibots were released as key chains by Fun4All. Essentially they were near identical reissues in reproductions of the toys original packaging with a tiny plastic loop molded on and a small key chain attached. At first Bumblebee and Cliffjumper were released, later Windcharger and Brawn followed. These little key chain figures were literally just the thing for somebody like me who was giddy with every step at the time in his love for transforming robots from Hasbro. I eagerly snatched them up even grabbing multiples as they were pretty cheap and just so damned neat. I loved them. Later at BotCon 2002, there was an incentive exclusive for those who preregistered. Not to mention, as Dreamwave was taking issue with 3H for selling a convention comic, 3H sold a small exclusive who came with the comic included. Those exclusives turned out to be Tap-Out and Glyph, made from the Cliffjumper and Bumblebee key chain figures! I was blown away by the fun exclusives as were others at the show. That was just the ideal thing at the time. Throughout the con I had a Bumblebee attached to the zipper of my con backpack and noticed others had the key chains on their bags as well. I saw a fan who had all of the key chains (including his new con exclusive ones) attached to his belt loops. It was a fun and everybody just loved these key chain toys. A little later at BotCon Europe 2002 they released Rook as the exclusive, made from Windcharger. Like others, I bought quite a few from 3H. It was hard not to love the key chain toys and exclusive versions were just a little better. In 2003 the key chain figures found their way to Japan by way of 7-Eleven exclusives with black colored variants as chase figures! I really wish I would have taken the opportunity when I had it to order a set. Those black ones are super cool. Oddly enough Fun4All went bankrupt in 2004 and around 2006 Basic Fun had begun selling the key chains in newer packaging. Yes I bought more, shut up. That was the last of the figures, though plenty of other TF key chains have came since. Oddly enough the key chain figures have a weird legacy. I've heard several times people misremembering the original G1 Bumbelbee as a key chain. Or I can't count the times I've seen one of the Minibots for sale with the loop cut off with a seller trying to pass them off as originals. I got one for a quarter once. I damn well knew it was a key chain with the parts cut off with some toenail clippers, but dude... a quarter. I guess with the reissues now hanging from the pegs at Walmart, one doesn't really need a return of the key chains. I hope to see more and more of the little guys at my Walmart. I've always really liked Minibots, it's hard not to. Those key chain versions of the Minibots were silly, but another fun way to enjoy the classic toys. Who doesn't like to have fun with their toys?